With his backward friend, Arthur Culombe, Joseph Taborsky robbed small shops, often killing their owners and whichever customers were unfortunate enough to be present at the time. He also raped numerous women and strangled six of them. Taborsky’s reign of terror lasted just ten weeks. Taborsky is the only convict sent to death row not once, but twice, for different crimes. At 14 Taborsky was sent to a borstal and grew to be 1.93 m (6 ft 4 in) tall. In 1950, on his 25th birthday, he murdered shop owner Louis Wolfson in West Hartford, Connecticut. His accomplice was his younger brother, Albert, who turned state’s evidence and received a life sentence. Joseph was sentenced to death. He spent four years and four months on death row but was reprieved because the only witness — brother Albert —had been committed to an insane asylum. He left death row in early October 1955 and said, “You can’t beat the law. From now on, I’m not even going to get a parking ticket.” He left the state for Brooklyn but often returned to visit his mother, Mabel. Taborsky then hooked up with Arthur Culombe and they began their crime spree. They committed several burglaries before becoming killers. At 6pm on 15 December 1956 Taborsky and Culombe robbed and shot Nickola Leone at his tailor shop on Zion Street in Hartford. An hour later they shot petrol station owner Edward Kurpewski, 30, in the back of the head after forcing him to kneel in the toilet. Daniel Janowski pulled into the garage at that time and was dragged out of the car by Taborsky, who shot him twice in the head. Six days later the pair robbed the grocers belonging to 64-year-old Arthur Vinton and his wife, 62. On Boxing Day 1956 Samuel Cohn was found shot to death behind the counter of his East Hartford shop. The till was open and empty. Just after 7pm on 5 January 1957 the pair pistol-whipped shoe shop owner Frank Adinolfi after asking to see a pair of size 12 dress shoes. As Taborsky was raiding the till, a couple walked in. Bernard, 47, and Ruth Speyer, 45, were both shot behind the right ear. Mr Adinolfi lived and his statement about the large shoe size led police to check records for villains with big feet. The last killing came on 26 January 1957 when Taborsky and Culombe shot chemist John M. Rosenthal, 69, twice in the chest at his shop on Maple Avenue, Hartford shortly after 9pm. 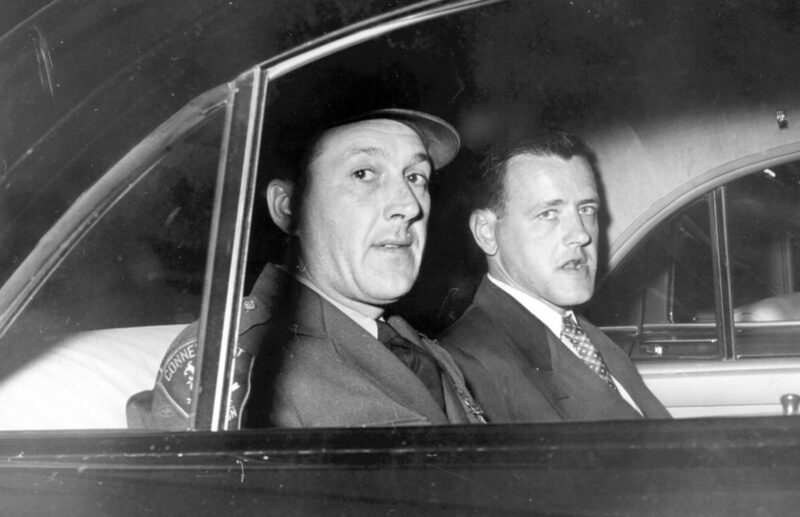 Taborsky and Culombe were arrested on 23 February 1957 and three days later Culombe confessed. Both men were sentenced to death on 27 June 1957. Culombe appealed and his sentence was commuted to life behind bars. On 17 May 1960 Taborsky, 35, ate a large banana split, drank a cherry soda and smoked cigarettes before being executed in the electric chair. That day Taborsky became the 73rd convict to die since Connecticut introduced capital punishment in 1894. Taborsky donated his body to Yale Medical School.